Whenever Per is out of town - and he has been quite a lot this fall - Titus and I have pancakes for dinner. It's quick, he can help me, and it's guaranteed to be a hit. I'm always looking for variations to try though (although I do love my basic recipe) and when I saw Smitten Kithen's corn pancakes, I knew that was something to try. 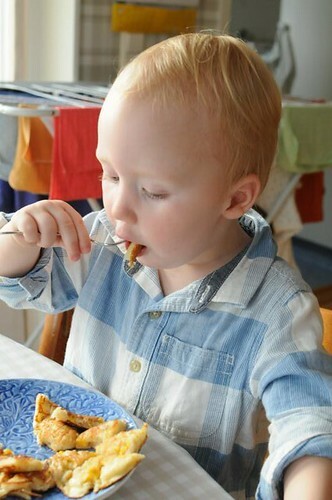 Titus LOVES pancakes! And corn! This was a huge hit! I ended up adjusting the recipe a bit, but it turned out to be absolutely delicious. A little more "foody" than plan pancakes, and therefor great for dinner. Bacon would have been good with these, but we were happy with butter and (plenty of) maple syrup. Start by melting the butter, and fry the corn for 4-5 minutes. They should color slightly. Set aside to cool. Whisk the egg with your filmjolk or buttermilk, and yogurt, sugar and salt. Add the corn, flour, cornmeal, baking powder and baking soda. 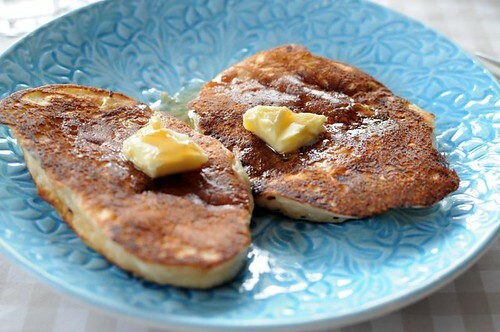 Fry small pancakes on medium heat in butter. Turn over when they start getting small bubbles on top, and look slighty dry around the edges. I haven't, but thanks for the tip!! Not sure I can find malt though, but I'll have a look. I've been craving pancakes ALL week and this does not help. Looks absolutely delicious.